Ikon has a scarcity of water and a relatively sparse atmosphere. The system has a population over 1 billion sophonts. It is a member of Julian Protectorate in the Tsahrroek Subsector of Empty Quarter Sector and in the Rukadukaz Republic. This world hosts a Military Base for support of military ground forces. 40% of the world's population is the Major Race Vargr. Less than 10% of the world's population is the Minor Race Bwap. The original Vilani name of the world was Gulimizuurkush. Overview Since Ikon is a Vargr–dominated non–Imperial system on the wrong side of the Lesser Rift, few Imperials grasp the system’s significance to the Vargr Extents. To the Julian Protectorate, Ikon is the Rock of the Sector: not only a powerful economic and cultural force within the Protectorate, but also the focus of Star Legion defended strategy. Ikon has a routine quality starport. Ikon possesses a Technology Level of TL–12 or TL-C in Hexadecimal Notation. Ikonaz Vilani wealth has been the powerhouse of Ikon’s technological elevation. While Ikon retained TL-11 throughout the Long Night, and slowly gained TL-12 during the first Imperial century, it was mainly Ikonaz Vilani corporations (and reverse engineering skill) that pushed further progress. The Julian War era’s TL-12 rose to TL-13 by c. 300, TL-14 at c. 550, and to an unsustainable TL-15 in the late 600 before slipping back to TL-14 in the early 700s. Even today, research labs on Ikon remain among the most advanced anywhere in the Julian Protectorate. Ikon has a Charismatic Oligarchy government. As the low level of the starport hints, most of Ikon’s wealth is kept on the world. This has been a successful strategy for the world, allowing her largely Vargr population to live in the kind of peace and comfort only dreamt about in most of the Extents. However, her unVargr–like introversion comes at a major political cost. Most of the money used to run the Rukadukaz Republic comes from Ikon, and Ikon indirectly contributes a significant percentage of the Julian Protectorate’s annual budget… but her say in deciding how that money is spent is a good deal less than you’d expect. Pirate risk: none. There are only various tax collectors in various uniforms - admittedly, very neat, clean, and well–pressed uniforms. Instead of worrying about pirates, Travellers should work on avoiding being ‘taxed’ more than once. Ikon is roughly three to four times wealthier than the rest of the Empty Quarter, combined. The closest contender, the Imperial Client system of Tokitre (Empty Quarter 1411), Imperial Pamushgar (Empty Quarter 1537) and Lazisar (Empty Quarter 1233), and the Lorean system of Zuethun (Empty Quarter 3007)}}, all fall short for various reasons. Of the four, Zuethun has the greatest potential to challenge Ikon someday, simply because it alone of the four (barely) avoids classification as a desert world, and avoids spending vast sums merely to feed herself. Unique and valuable compounds were available from the oceans of Gulimizuurkush (later called Ikon), and even though the world was lifeless, it’s physical and electro-chemical profile required very little alteration to accept imported life forms - almost as if Gulimizuurkush was already ‘prepped’ to accept life. When the Vilani first colonized the world, they followed the typical pattern of settling in river valleys and rich fertile plains. The need for workers to live close to the undersea mines acted as an impetus to establish underwater settlements on Gulimizuurkush, with the land above used for ore processing. Demographically, 62% of the population is Ikonaz Vilani, and 38% are Ikonaz Vargr: a trace amount of non–Ikonaz humaniti, descendants of the Imperium also reside on the world. Generally, the Vargr are somewhat wealthier, and have an unconscious air of superiority vis–à–vis the Vilani. The best estimates fixed Mixed Vilani at 0.03% of the population, with ‘other sophonts’ numbering no more than 10,000. Most Ikonaz Vargr despise Vargr languages other than their own: local scholars are more likely to know Old High Vilani (language) or Ancient English than a single word of Vuakedh (widespread among the Vargr of the Protectorate) or Evrgoer (the most common Blood Vargr tongue of the Hegemony.) Several Ikonaz Vargr traders have some command of these languages, but they will pretend ignorance in polite company. Whenever possible, Ikonaz Vargr prefer to use portable translators or robots instead of filthing their tongues with the babble of the lesser Vargr. Civilization The planet itself is home to 10 billion sophonts… but looking at the planet’s nightside from orbit, you’d be hard–pressed to spot any of the usual constellations of city lights you’d expect to see. Even the floating cities that naturally dot the sky of a TL- 14 world are largely absent. Instead, the land surface of the planet is covered with symmetrical, elegantly designed formal gardens on a heroic scale. Where the determined gardeners couldn’t get anything to grow, they shifted rock and ice into complex patterns and sophisticated curves. Even the mountains are chiseled, shifted, and blasted into a type of visual poetry that pleases the Ikonoaz. Instead, almost the entire population lives undersea, with 80% of the population living in extremely advanced cities next to the flooded, abysmal gashes left after the Event occurred. Snuggled close to the highly automated mines and refineries that cover the undersea gashes, these magnificent cities are the pride of the Ikonaz race. Typically, an Ikonoaz undersea city starts out as a dome or a cylinder, of a height no less than 80 km in height. Within the megastructure are several mushroom–shaped ‘platform cities’: soaring between 6 and 10 km into the air, they are topped by a round ‘platter’ with a diameter of about 5 km. The platter has its’ own dome which ascends a height of 2 km, holding a series of buildings averaging 500 m and 800 m in height. Between 10 to 40 of these ‘platform cities’ are enclosed inside the massive dome. The space between the platforms is usually used as forests or gardens, but the area may also be turned over to urban development. History Ikon serves as the homeworld of the Ikonaz Vargr. Practically all Vargr within the Republic are descended from the Vargr who conquered the riches of Ikon in -1711, near the end of the Vargr Pillaging. Unlike most Vargr cultures, the conquerors of Ikon were generally willing to let the Vilani be, so long as they could get the important titles and collect the taxes. Over time, the Vilani culturally overran the Vargr overlords, reshaping the local Vargr to what they are today. It is well known that Ikon was shaped by a sophont species which lacked jump technology. First, it was deeply scarred in an Event that occurred about -10,200 Imperial. The Event shattered the northern hemisphere of the planet to a depth of 1000 km, about a third of the way into the heart of the planet. The level and nature of the shattered crust and mantle suggests an impact with a large object moving at near–superluminal speeds. Soon afterwards, between -9,000 and -10,000 Imperial, the world was extensively terraformed, with a bulked–up atmosphere, the stabilization of the world’s mantle and crust, and the transport of an ocean’s worth of water to the world. However, development of the world stopped abruptly at about -9,050, before lifeforms was introduced. The identity of the ‘worldshapers’ remain unknown to this day. The conflict known as “the Civil War” (117-119) lowered Ikon’s tech level briefly from 11 to 10. 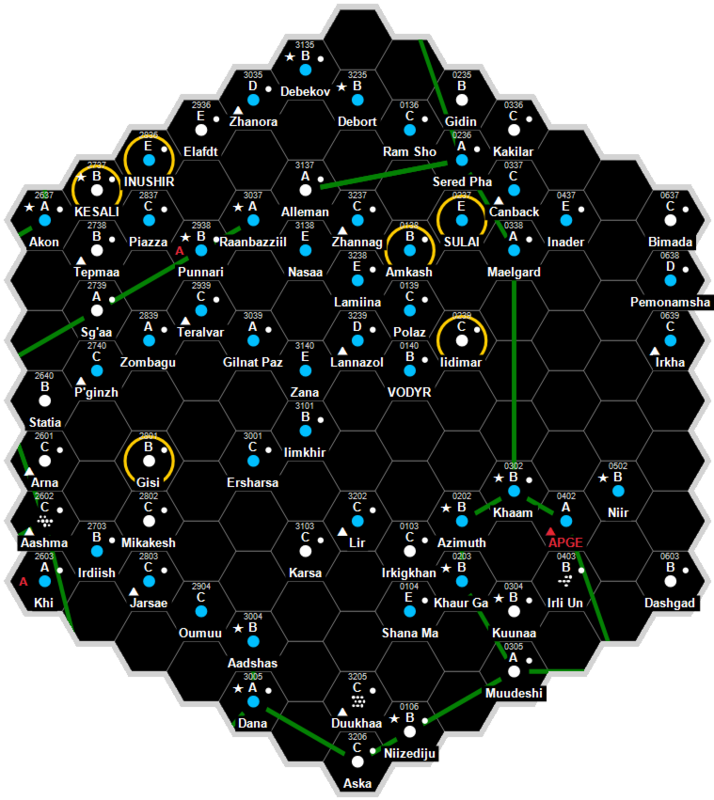 The Antares Pacification Campaign brought in numerous refugees from Imperial persecution to Ikon. The Julian War (175-191) saw numerous attacks on Ikon, all of which failed in breaking the homeworld of the Ovaghoun Vargr. The fall of the United Parliament government on Ikon led to the birth of the Anarchical Age. Ikon’s atmosphere was declared tainted in 400. The Thertziraakh undersea megalopolis failed, and 19.9 billion sophonts died soon thereafter. This was the catalyst for many changes on Ikon. The last of the famous A’grangrigk-style undersea cities was finished in 744. At 700 Imperial, Ikon’s population peaked at 300 billion sophonts, at TL 15. Heavy Ikonaz (Ovaghoun Vargr and Vilani) emigration from 725 to the 770s, and a second wave, from 820 to 860, was the primary means of lowering the population. Population aging also worked to half the population every 50 years for a time - this is no longer true, as of 993 Imperial. After 80 years of work, the industrial taint of the atmosphere was declared removed in 807. Jason Kemp. "Feature Adventure: Ikonic Voyage." Stellar Reaches 09 (2009): 27. Alvin Plummer. "Hegemony, Republic, Duchy: Part I." Stellar Reaches 10 (2010): 8. This page was last modified on 28 March 2019, at 13:17.